Biography & Genealogy: Dallas Flannagan, Class of 1887: Genealogy: Born- Oct. 11, 1866 in Charlottesville, Albemarle Co. Va. Father- William W. Flannagan of Albemarle Co. Va.; Mother- Frances (Fannie) Jordan of Rockbridge Co. Va. Pat. Grandfather- Benjamin Collins Flannagan of Fluvanna Co. Va.; Pat. Grandmother- Annie Virginia Timberlake of Albemarle Co. Va. Mat. Grandfather- John Wynn Jordan of Rockbridge Co. Va.; Mat. Grandmother- Rachel R. Davis of Germantown, Pa. Married- On Oct. 1, 1890 to Elise Coke of Richmond, Va. Children- 1- Coke Flannagan; 2- Empsie Flannagan. 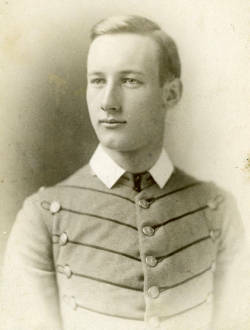 VMI Record: Entered VMI- Sept. 7, 1882; Dismissed Nov. 24, 1886 for allowing a non-cadet to enter barracks; Reinstated Dec. 13, 1886; Graduated June 24, 1887 ranking 16th in a class of 20. Also attended L.L.M. New York University. Careers: Lawyer; Judge of Court of Common Pleas in Newark, NJ. Died- Oct. 19, 1949.